The pact, reached after weeks of harried negotiations, halted a flawed review of millions of mortgages in foreclosure. Regulators, led by the comptroller's office, hastily scuttled that review amid heightened concerns that the process was generating billions of dollars in fees for consultants, but providing little relief for borrowers. The effort was abandoned after consultants examined a tiny fraction of more than four million loans in foreclosure from 2009 to 2010. 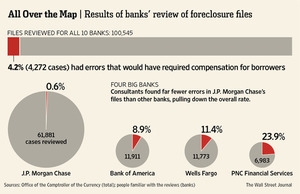 Ultimately, consultants completed a review of 104,000 loans, regulators said Thursday. -- Dealbook / NY Times.